This piece was originally published on Medium. The DataBasic.io project is supported by a 2016 Digital Impact Grant. Most of the larger non-profit organizations we work with are scrambling to figure out how to deploy complex technologies like machine learning and “AI” in service of the social good. These include inspiring examples that range from poverty alleviation, to home fire prevention, to self-harm risk reduction. These stories have spread widely and have come to define what a data-centric organization should be doing — namely complicated data science. 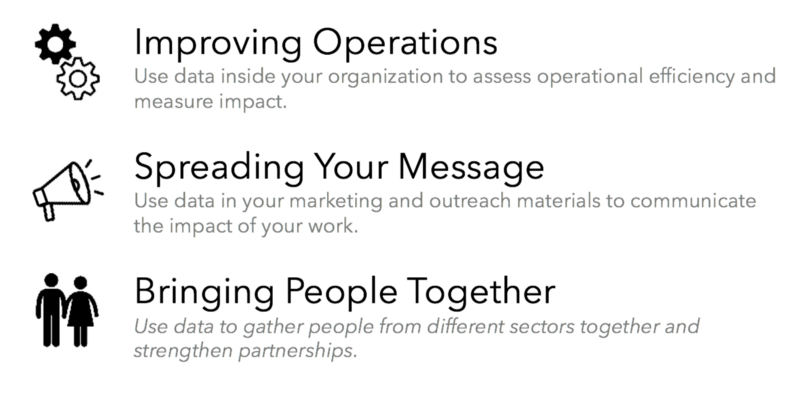 However, if you’re an organization thinking about how to use data better, this is not where you should start. You don’t need a data scientist, you need a data culture. We’re trying to help here by creating the “Data Culture Project” — you can expect to hear more about that early next year. This gives organizations a lightweight, self-service curriculum or video-facilitated activities. We’re piloting that with 30 organizations right now, to learn from how they approach running these over three months within their organizations. We were working with a large nonprofit to build a data culture across their organization, but they were stymied by people that thought they owned the data, and were hoarding it from others as a form of job security. The only way we found to work on it was risky — to sneakily use it and then credit its successful use to the owner retroactively. It helped, but we can do better than that. Most organizations suffer from these silos — independent functional units that take pains to control a slice of the overall work. You have to acknowledge these walls in order to break them down. Over and over we hear from organizations where IT is running Tableau trainings regularly and they just can’t understand why people aren’t adopting the tool and approach. I’m like a broken record telling them that you need to separate the tool and the process — the tool training can be owned by IT, but the process training doesn’t need to be. Note from the author: This post is based on a presentation Catherine D’Ignazio and I gave to non-profit leaders convened by the Stanford Social Innovation Review. Thanks to Catherine D’Ignazio, Ethan Zuckerman, and Emily Bhargava for feedback and edits.